Special shoutout to Lindsey Leigh of My Iowa Life, hope this helps out! 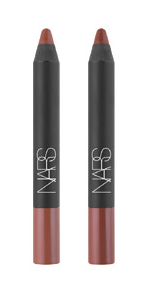 I myself use NARS Velvet Matte Lip Pencil in Cruella with their Lipliner Pencil in Jungle Red. The Velvet Matte Lip Pencil is absolutely one of the best things I've ever purchased. My friend Lauren turned me on to it a couple of years ago (her color of choice, as I recall, is Red Square) and I am eternally grateful. Seriously. The color wears well, though you may need a quick reapplication if you're going to be having a meal while you wear it, but it's so easy with the pencil you won't mind. And it feels like wearing silk on your mouth. I will caution, however, that much like wearing the proper undergarments beneath silk clothing, you can't have any of that nasty dead skin flaking around on your lips, it'll show up easily beneath the color. Quick fix: Wet a toothbrush and scrub it across your mouth for about ten seconds, gets rid of those nasty bits -- see, I am capable of doing some things on the cheap. I know, terrible picture. Ever since I started this blog adventure, my inescapable desire to avoid having my picture taken is catching up with me. But you get the idea, you're all smart people. Remember, don't be afraid to go out there and experiment at the make-up counters or Sephora before you commit to something. For real, if you go the NARS route, for example, you don't wanna be out almost fifty dollars on a red that makes you look like some kind of goblin because it has too much orange in it. That being said, everyone has a red that looks good on them. Go find it! *You will come to learn that I am vaguely decidedly obsessed with NARS, particularly for color. Their e-mails are the only ones I allow to come into my inbox with the pictures already displayed. i used to only wear pink lipstick, but i FINALLY tried red for the first time a couple weeks ago and LOVE it! you're right - there's a shade for everyone! So true about red lips! 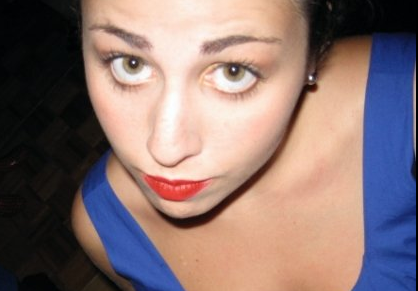 I recently discovered I can wear red and I am never looking back. Aw! Thank you SO MUCH, Harris! This is super helpful!